Yes, the Phaeton. Like everyone else, when I first heard Volkswagen would be producing a $100,000 car, I was aghast. Was this the same Volkswagen that built my friend Tristy's Scirocco? Aside from constantly belching black smoke, that car's passenger seat would snap off its runners on every left turn. Six figures for a fat Passat? I'll pass, thanks. But then, details started trickling in. The Phaeton would share an all-wheel-drive, air-suspended platform with both the Bentley Continental GT and the Audi A8L, including the mega-compact 6.0-liter W12. That's some Brucetastic DNA. Snob-wise, the Phaeton would be at the correct end of a one-way street. While some jokers might climb into a Bentley and cringe at the Volkswagen-sourced gear selector, ain't nobody's getting into a Phaeton and bemoaning, "Hey, that's the knob-a-roo from the Continental GT – gross!" Sure, the biggest-ever VW would come from a fine family. But then again, so do the Hilton sisters. ch was in sole possession of the cash, boffins and cojones to attempt not only yanking Volkswagen up by its own lederhosen, but building the very best car in the world. He succeeded by half. ch's Folly." Worse, there are those who say Volkswagen had no business building a car that competes with the likes of BMW, Lexus and Mercedes-Benz. This type of "know your place" thinking is reactionary, wrongheaded conservatism at its worst. What if Chevrolet had never bothered with the Corvette? What if Ford never greenlit the Mustang? What if Carroll Shelby had kept on farming chickens and not taken on Enzo Ferrari? Naysayers are always quick to chastise a carmaker for overstepping their brand, to which I answer, "Buick GNX." Even Farago, who's issued such pronouncements as, "Volvo should only make safe cars," was so impressed by the Phaeton that he defied his own mantra and declared it a hit. To reiterate, that type of can't-do thinking would have BMW still popping out inexpensive bubble cars while poor Volkswagen lumbered along with nothing but the Beetle. The Phaeton W12's stats are humbling: 444 horsepower squeezed from one of the world's oddest and most complex engines. (All pistonheads would be well served by reading the technical mumbo jumbo behind the VR6 and W engines.) For comparison's sake, the Rolls Royce Phantom produces just nine more horsepower from a larger 12-cylinder. Inverse to last week's Corvette ZR-1, the Phaeton's engine is the least interesting thing about the car. According to a tall, blustery Brit named Jeremy, if one were to remove the Germanic 155 mph limiter, the Phaeton will top out at 201 mph, which would be faster than a contemporary Z06. Is this totally true, or more fibbing from Clarkson? Who knows. Still, have a look at these German hoons doing 174 mph without a speck of trouble. That's remarkable for any 5,100-pound car, let alone a VW. But an engine is just an engine. What makes the Phaeton so well suited to the JFG is everything else. As Jezzo said, "the attention to detail is staggering." Name something the Phaeton does better than your car. You have comfy seats? No, really, according to the Phaeton you don't. Its chairs are covered in Italian cows, adjust in 18 ways, heat and cool your bum, massage your lower back and support your lumbar. The front seats in the Phaeton are nearly as plush as the rear seats in the Rolls-Royce Phantom. And the back isn't too shabby either, what with an acre of knee room. However, the killer app is the world's first four-zone climate control system. You know how, when it's hot out and the AC is blasting cold air cold air across your frozen knuckles even thought the rest of the car is still in the triple digits? Well, the Phaeton has regular vents to quickly heat or cool the cabin. But once the desired temperature is achieved, covers deploy over those vents and act as radiators, sparing your poor, icy hands. This feature, which came standard on the Phaeton in 2004, should be showing up on the big German and Japanese saloons, oh around 2010. Then there's the exterior. True, I'm not the world's biggest fan of the face, which shares too many lines with its contemporary Jettas and Passats. 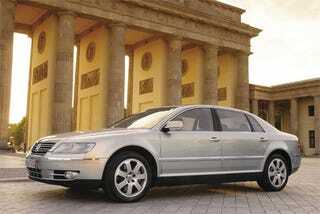 But once you get past the A-pillars, the Phaeton is sensational. The stance, the proportions, the hulking C-pillars, the rear end; it's all perfect (especially in black). Best of all, the leviathan is stealth personified. To the layman, you're driving nothing more than a rather large Volkswagen. But to the car freak in the know, you're into something special. But special enough to park in one of the Jalopnik Fantasy Garage's 50 berths? I enlisted some expert advice in the form of the LA Times's Dan Neil, who graciously shared his thoughts with me for the low, low price of one beer and two cigarettes. ch's willfulness, which you could say also about the Veyron — so it has a kind of kinship with that monster. The Phaeton was subversive, too. It demanded you respect it in spite of its badge." Subversive. We love that in a car. That's why we love all Citroens unconditionally. We also salute any machine built without compromise. In fact, that's one trait all Fantasy Garage inductees share. "It's also kind of a time-and-place car. Like the old Mercedes 500E, the Datsun 240Z, the Viper, cars that say something about the state of the industry." ch in particular seemed unstoppable just a few short years ago. Before Porsche's takeover machinations, the weakened dollar against the Euro and VW's stale and aging product line finally affected sales, the limit — from chairman Piech's point of view — was only the sky. He'd already bought up Audi, Lamborghini, Bentley and Bugatti, the latter of which would be building the most powerful, fastest and most expensive car in the world. Why not build a $100,000 Volkswagen? But even more than that, why not build a redeemer? Why not build the best car in the entire world? Before you vote I would like you to consider two things. The first is that low-mileage W12s are all over the internet for about $40K. The second is that before WW2 the word Phaeton referred to a particular class of Automobile. Sadly for us, Phaetons don't exist anymore. Volkswagen AG: No Scirocco for US!